Now, without meaning to blow my own trumpet, most people who know me (I believe) would describe me as a fairly organised person. 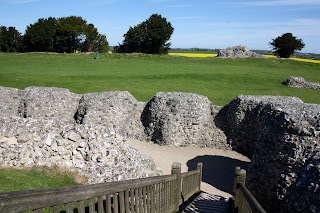 However, on the day that I was due to visit Salisbury with a group of other archaeology students from Oxford, I was not organised. Not one bit. In fact, I'd totally forgotten that I was going, and had woken up 15 minutes before our mini bus was due to leave to a text from my friend Francesca asking where I was. Oops. Thankfully, after getting dressed in precisely 5 seconds flat and running as fast as I could to the bus stop, I made it! 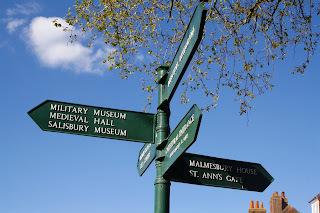 So, here's how I spent my day out in Salisbury! 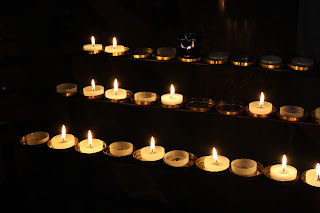 The highlight of our trip was definitely our guided tour of Salisbury Cathedral. 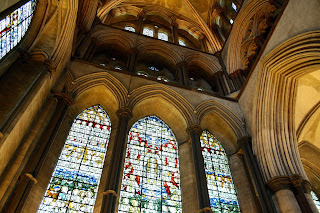 For over 750 years, the cathedral has welcomed pilgrims from across the globe, and it's not hard to see why! 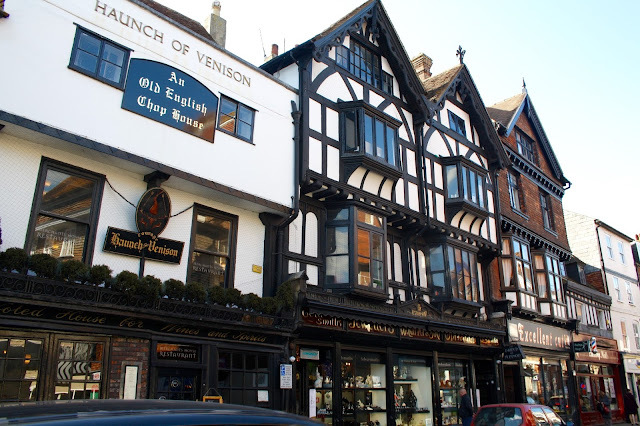 The exterior architecture is just stunning, and if you go on a tower tour like we did, you get to climb the 225 feet to the top of the spire, which is the tallest in the UK! The tours can take up to two hours, and I was thinking that I might be a little tired of it by the end, but that certainly wasn't the case! Our tour guide was very jovial, knowledgable, and kept everyone in the group engaged. When we reached the top of the tower, he even gave us a toffee and a badge to mark our achievement, which was really cute! 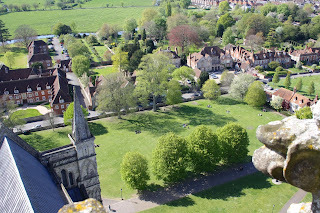 The top of the tower provided panoramic views across Salsibury and surrounding Wiltshire, which on a beautifully clear day that we were lucky enough to have, were especially stunning. On the tour, our guide pointed out features of interest that you wouldn't otherwise notice, like how part of the cathedral visibly sags under the weight of the tower - eek! 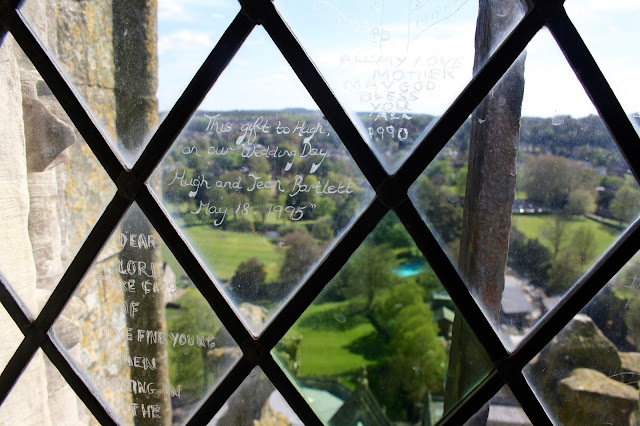 Another thing that I really loved were the engravings on many of the panes of glass in the tower windows, apparently they used to charge visitors who wanted to inscribe messages on the glass! Some people had chosen to commemorate births, marriages, and deaths, and others had drawn pictures - it was fantastic to see the evolving history of the tower through these etchings. Again, if you know me well, you'll know that I absolutely love visiting National Trust properties. Call me a grandma if you like, but I think they provide a perfect day out, which is very reasonably priced if you have a National Trust membership like I do. 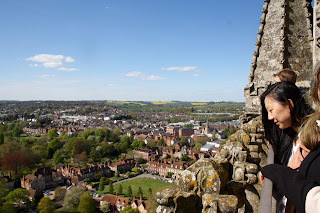 So, when we turned up in Salisbury and unexpectedly discovered a NT property in the close next to the cathedral, of course we had to look round. 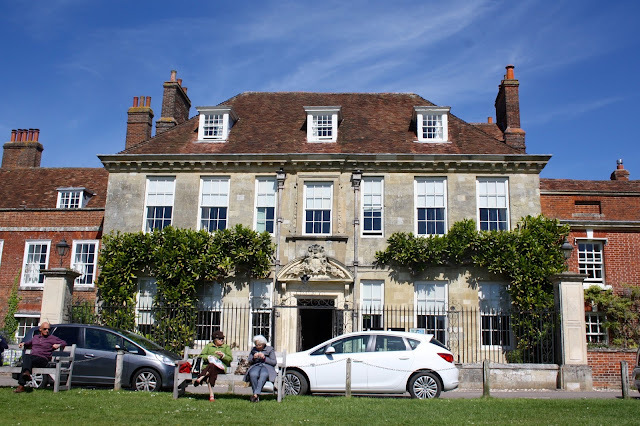 Mompesson House is an 18th century townhouse with a beautiful garden, which the National Trust is currently in the process of restoring. 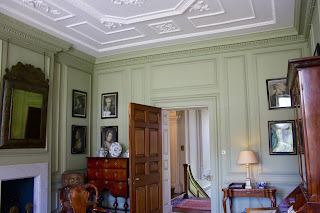 Apparently the last occupant of the house, whose ancestor had bequeathed the house to the National Trust prior to his death, left only the curtains in the house when he vacated the premises - something tells me that he wasn't terribly happy at having to move out! The house has numerous claims to fame, including as a setting for the 1995 film Sense and Sensibility, starring Kate Winslet! One of my favourite rooms in the house was the library, which had a stunning blue moulded ceiling! The best feature in this room was a small bookcase, or rather - a cocktail cabinet which was disguised to look like a small bookcase! 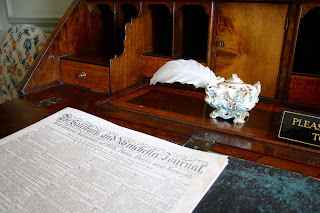 I've now decided that I want a cabinet just like this in my dream house! 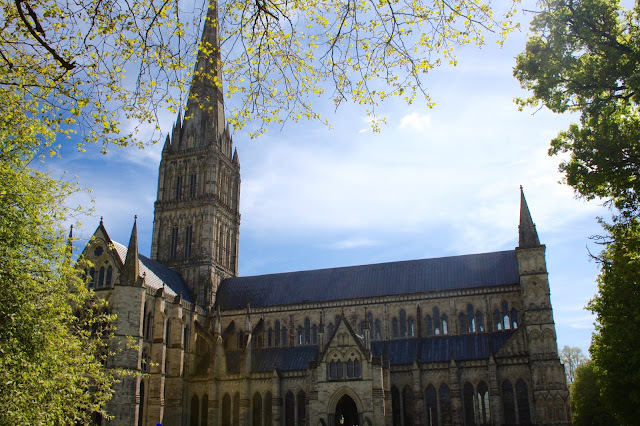 Aside from the cathedral and the close, the centre of Salisbury itself is very picturesque! We wandered round some beautiful parks at lunch time, and there were no shortage of spaces to stop off for a picnic. As for shopping, a real highlight was watching fudge being made at Roly's Fudge Pantry. 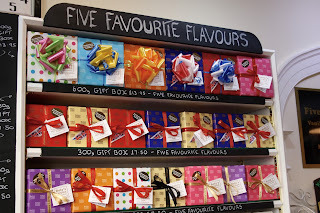 Located next to the historic arch which signals your entry to the cathedral close, the fudge pantry sells pretty much any flavour you could ask for - the butterscotch offering was a bit hit with me! However, if you are on a tight budget, there are plenty of places to grab quick, cheap snacks too. Francesca and I (as typical students) went to Poundland for our ice cream! 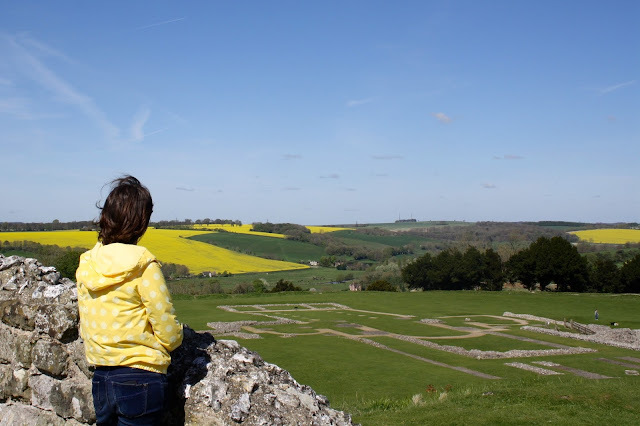 Being the old-school cool archaeologists that we are, we also stopped off at an Iron Age hillfort on our trip to Salisbury. 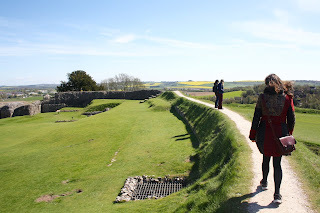 This was located at Old Sarum, a site with over 2,000 years of history. The foundations you can see in the large photo above are actually of Salisbury's first ever Norman cathedral - according to our guide, the Norman monks had such a bad relationship with the soldiers stationed within the fort that they requested a new cathedral to be built away from the pesky military men! The new building is the cathedral that you see today! 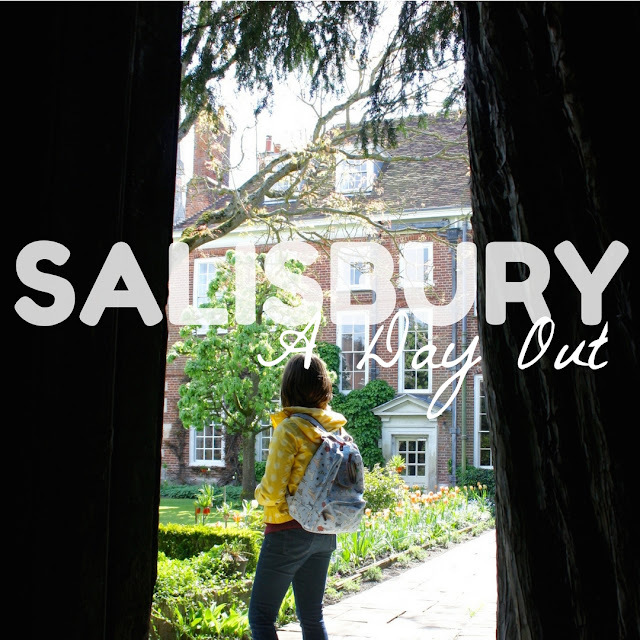 Have you ever been to Salisbury? Where is your favourite place for a day out in your local area? Please share your recommendations with me in the comments below, and I may well pay you a visit!